It is very often said in popular articles about meteors, comets and asteroids that they all represent the material that is left over from the very beginning of the solar system. It is further said – often – that these bodies “accreted” from smaller material flying around in what is called the “planetary nebula.” That means that they kept gravitating toward each other until the collection of material became an asteroid or a comet. I dispute both of these assertions by astronomers. Why? Because I think that they call up accretion as a mechanism, without ever asking what happens during accretion or if the temperatrues and pressures and impact forces available can actually do what they say accretion is or is doing. When one reads about how asteroids or planets form, the say “accretion” and then go on to what happens after accretion, without really ever having to explain it. Why do I think any of this? Because there is insufficient gravitational force between small objects in space. There is also insufficient pressure in space to turn molecules of metals into solid chunks of metal, nor to alloy them together. Let me start with a few definitions. I am putting them at the bottom here, so that I don’t lose the reader at this point with boring stuff. I just looked at the list of elements and molecules present in the most studied meteorite in the world, one called the Allende meteorite. The list runs to 17 main components and 57 elements. That means over half the Periodic Table is represented in ONE meteor. That is one helluva cocktail. 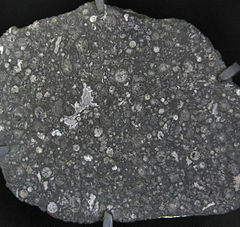 All those chondrules, plus the matrix that binds them together, contain all those compounds and elements I mentioned.